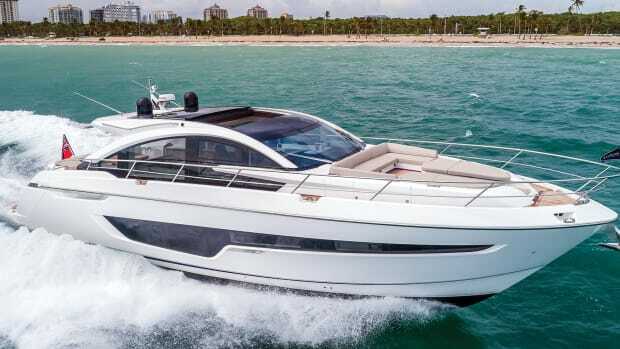 The youngest sibling in the British Builder’s lineup, the Fairline 43 Targa Open looks to play a big role in their future success. It was one of the tightest docking scenarios I’ve ever seen. 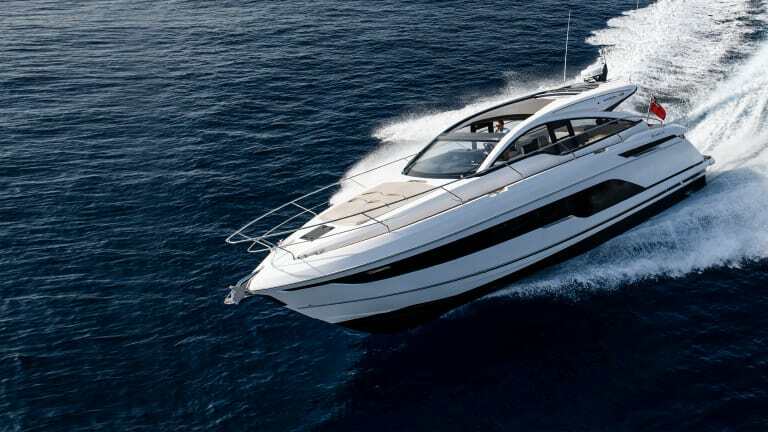 My pulse quickened and my palms got clammy just thinking about having to back a fresh-from-the-factory Fairline 43 down the fairway, only to hook it at the last second to avoid a garrison of gelcoat-crunching anchors jutting out into the narrow channel. 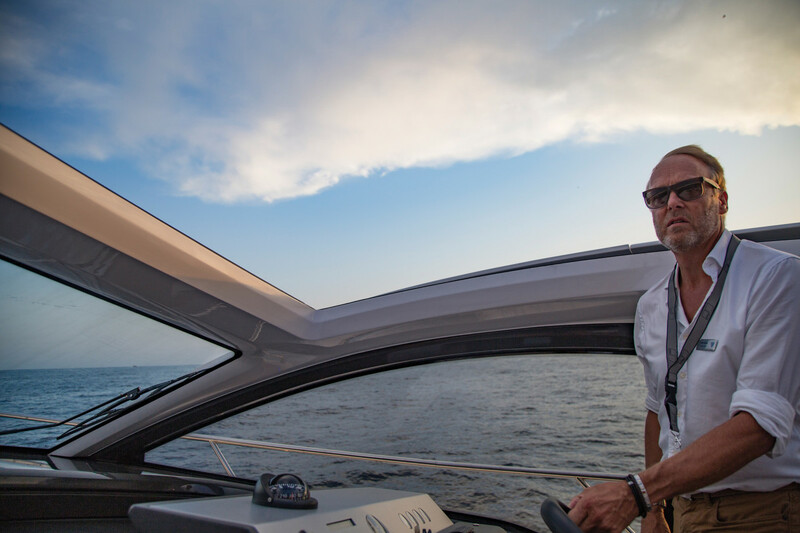 Fairline’s Business Development Director Karl Gilding stood at the helm with his head above the sunroof, his eyes ping-ponging back and forth from the port to starboard quarter, then back again. Gilding is not one to be judged by his title: This guy can back down a boat. Yes, I know, I know—pods and a joystick can make heroes out of even the most inexperienced skipper, but this slip was t-i-g-h-t. With the sun sinking behind the mountainous French countryside he completed the maneuver and the boat was once again secured to its slip, no worse for wear. 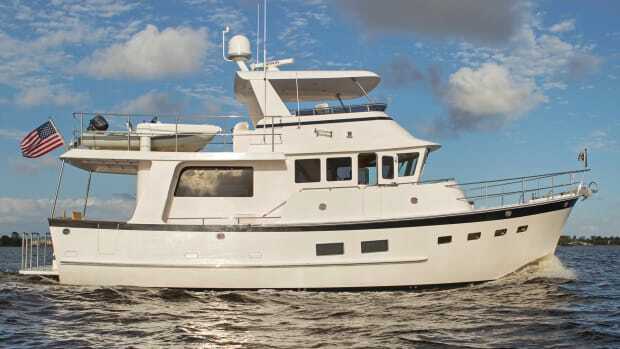 It was one hell of a way to wrap up a successful sea trial for a boat filled with prospective buyers. When building an entry-level model there’s sometimes pressure to pull back on the level of finish to reduce cost. That’s not the case here. A couple days earlier, in a decidedly less stressful setting, I met Fairline’s Head of Design Andrew Pope standing on the swim platform of the U.K. builder’s newest offering under bluebird skies at the Cannes boat show. Pope and I had been at the same place the year before aboard the builder’s highly anticipated 63 GTO. That model marked the first time the design team partnered with Italian design star Alberto Mancini to reinvigorate the brand’s lineup. That model nailed the design brief; I was interested to see if lightning would strike twice. It was like déjà vu stepping aboard the 43. The exterior lines are exceptionally sporty and the interior is as wide open and bright as they come. “I can’t wrap my head around why you called this the 43 Targa Open,” I sarcastically mentioned to Pope as I looked up at the biggest sunroof I’ve seen on a boat this size. The trend toward larger sunroofs is one that’s been prevalent at almost every major show, but opening this nearly 8-foot-wide by 11-foot-long sunroof made me feel as if I just pulled the ragtop back on a Corvette. It simply changed the experience. 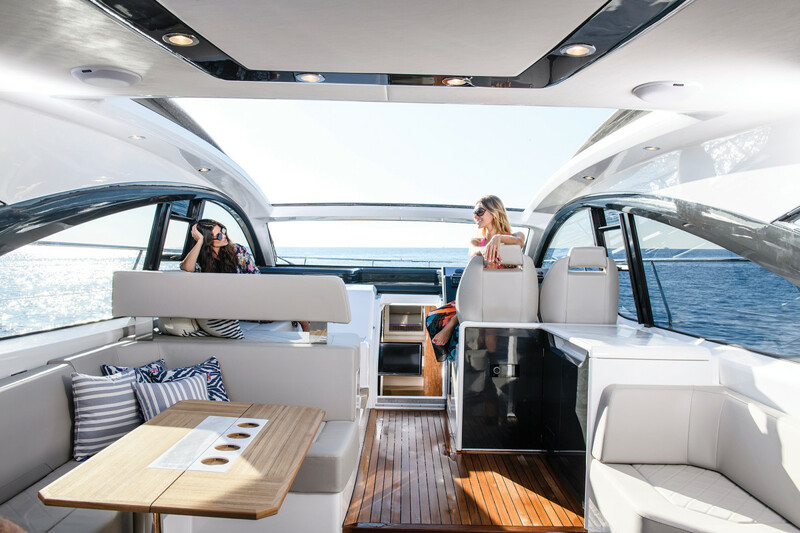 Whether you’re lounging about or navigating a tricky waterway, the sunroof on the 43 is a game changer. 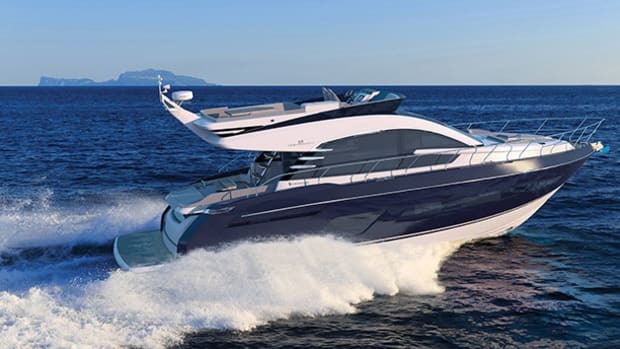 Speaking of engineering that you can’t see, a lot of attention was paid to designing the hull specifically for its twin Volvo Penta IPS600 propulsion package. As the only power option for the builder’s entry -level model (there’s a killer-looking 33 on the way) it had to perform, and perform well. Don’t let the name fool you: The stowable Williams MiniJet is more than up to the job of taking a family of four ashore or to the marina. I can attest to that. Standing at the helm shortly before sunset is enough to lull even the most fastidious boat testers into a dreamy haze. I had been impressed with the sporty performance of the 63 GTO but was really interested to see if the younger sibling could hang. From the sitting position, I found that the helm felt similar to a car in that everything you needed was within easy reach. The raked, single-pane windshield was a little low for my liking, especially if you were on a longer cruise. Cracking open the sunroof and driving from standing, (I’m 6 foot 2) I was head and shoulders above the windshield and had a great view all the way around the boat. 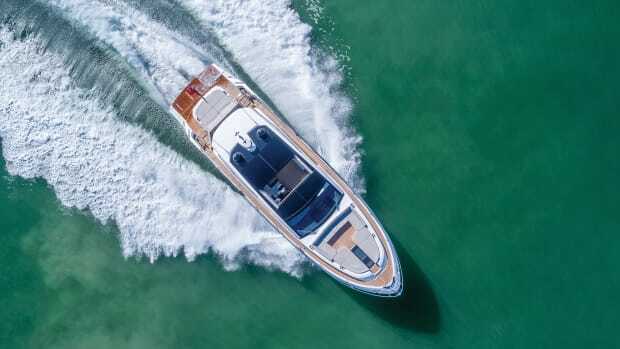 She didn’t carve turns quite as sharply as the 63, but she did surpass her top speed by a few knots; the 43 clocked a two-way average of 30.1 knots. The ride was smooth. She cut through what little chop we encountered and landed gently any time she found a steep wake from a passing yacht. The most impressive aspect of this boat’s performance was that she came onto plane at just 11 knots. This allows owners to run at a comfortable clip for long distances while not sweating the fuel burn. 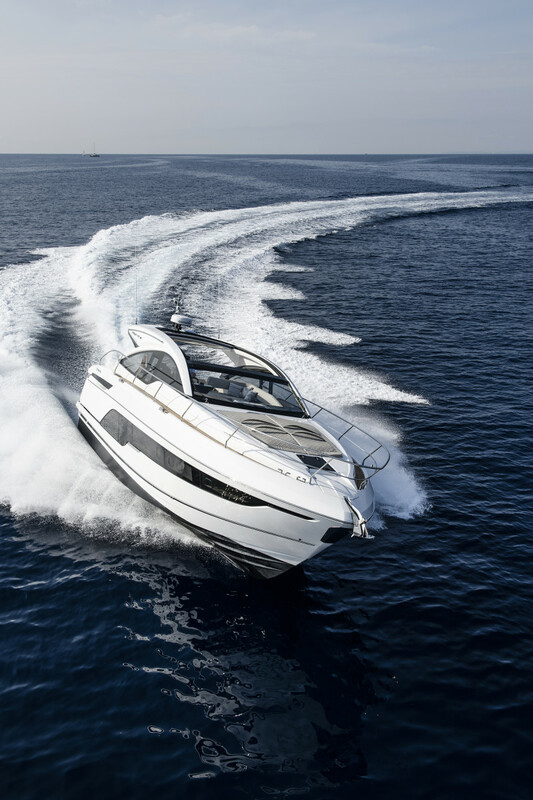 While the 43 Targa may now be the entry-level model for Fairline, it’s also in the unique position of being extremely important to the company’s success. 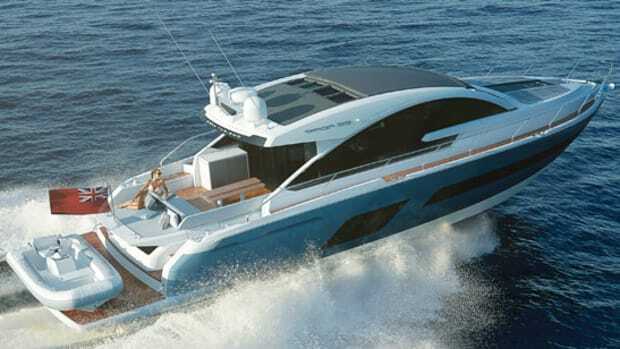 The 63 that debuted last year showed they can compete with larger, modern motoryachts and the stunning, in-build 33-foot F-Line proves they’re willing to be different and build outside their comfort zone. But the 43 lives in a very popular part of the market here in the U.S. and abroad. Competition amongst the big three British builders has intensified noticeably in the last couple years. 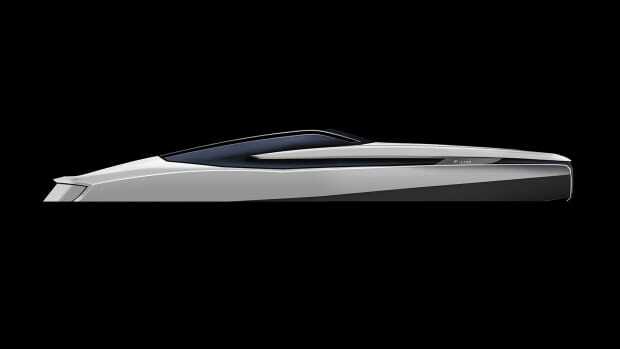 This model will be going up against a number of quality boats. 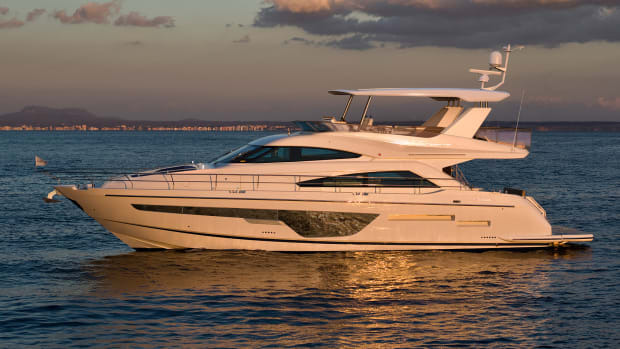 The attention to detail and finish of the 43 make it clear that Fairline recognized how important and competitive this segment is. 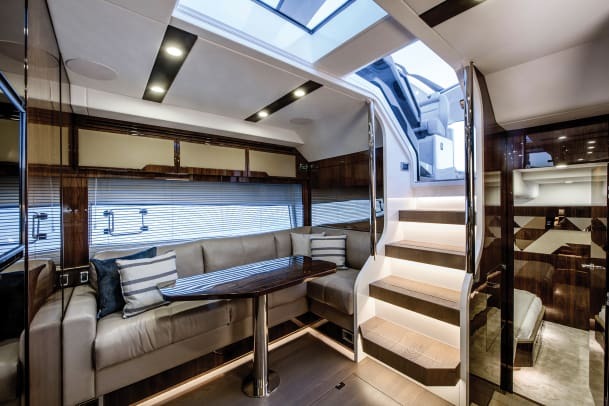 From big things like the woodwork to smaller details like hinges and latches, it’s obvious Fairline pushed themselves to achieve a high level of finish with this build. As with any boat that’s fresh from the factory floor like our test boat was, there are a couple small tweaks still left to make. The sunroof was prone to jamming courtesy of a loose cable—and it was in need of a handrail on the port side of the helm so a guest or copilot could stand next to the helmsman and have something to hold on to. The builder said both would be remedied. 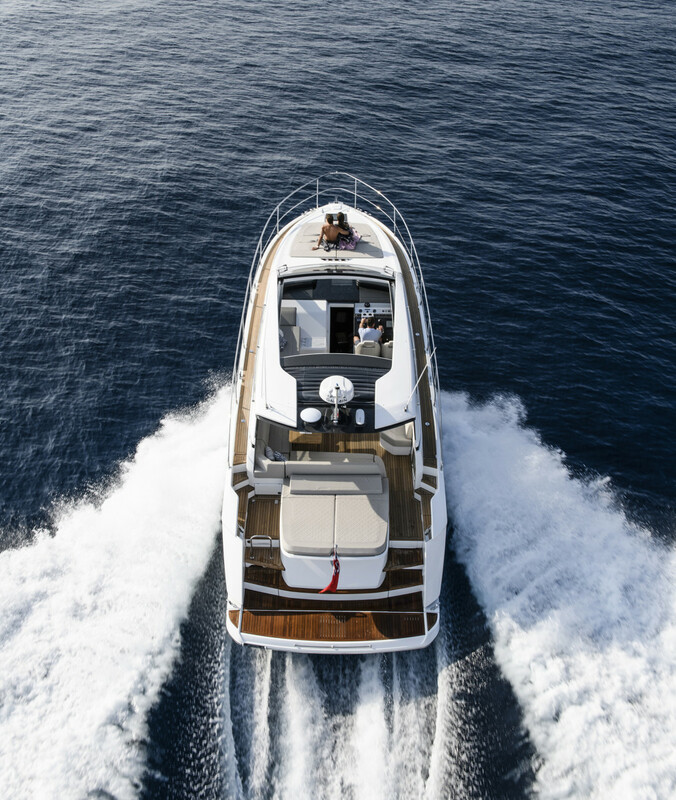 As is usually the case at the Cannes show there were a number of prospective buyers aboard for our sea trial—in this case, a family and a pair of friends. While some journalists grumble at the very idea of having to share a boat during a test, I find it helps me visualize how real boaters use social spaces. I noticed that the large aft sunpad (above the tender garage that can fit a Williams MiniJet) was a popular spot. But, as is usually the case, no one stayed lounging for long. 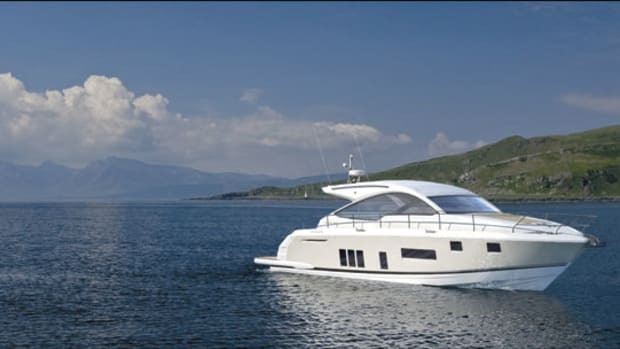 The guests inevitably made their way to the salon, which features adjustable seatbacks and a single sofa seat that can be unlatched from the starboard side and slid over, so someone could join the conversation to port. This space, complete with a table that can be folded in half and then disappear into the seating to port, allowed six people to relax and have an easy conversation. That type of flexibility continues into the accommodations. There’s a galley down with a nice sized L-shaped settee. I’m a fan of the galley down in cases where the boat is so wide open on deck like the 43. It gives you a sense of privacy, especially in the morning and evening hours. 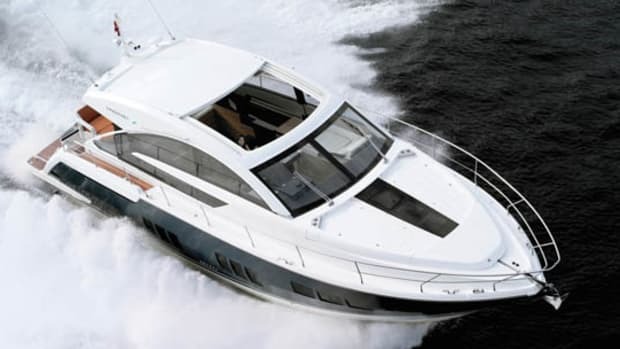 Our test boat had the amidships master and VIP forward. And I have to say, I like the setup with the berth facing transversely. On land you usually go to bed and wake up facing a wall or TV; when you’re out on the hook somewhere you can’t beat the feeling of looking straight out onto the water. It’s guaranteed to get your day started on the right foot. 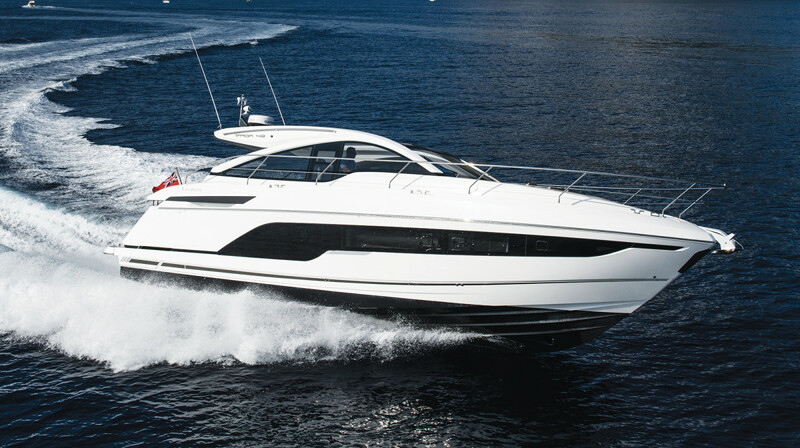 As is the case with any entry-level model, Fairline hopes the 43 will attract new and younger buyers to their family. 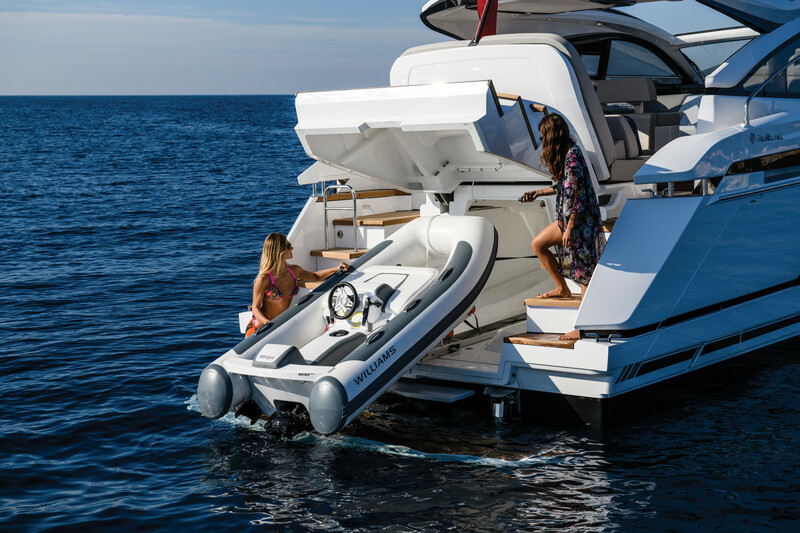 From what I saw dockside, and on my test, I think they should add some chairs around the dining room table: The Fairline family is poised to grow quickly. Test Conditions: Seas: 1-2 ft.
Load: Fuel: 150 gal. ; water: 60 gal. ; 14 people on board. Speeds are a two-way average recorded via GPS. GPH taken via Volvo Penta engine display. Sound levels measured at the helm. 65dB(A) is the level of normal conversation. Range is based on 90% of advertised fuel capacity.